Liverpool started the season in style on Super Sunday as they condemned West Ham to a 4-0 defeat in Manuel Pellegrini’s first game in charge. Jurgen Klopp’s side made light work of the Hammers at Anfield to move above Chelsea at the top of the table, the latter having beaten Huddersfield Town 3-0 on Saturday. 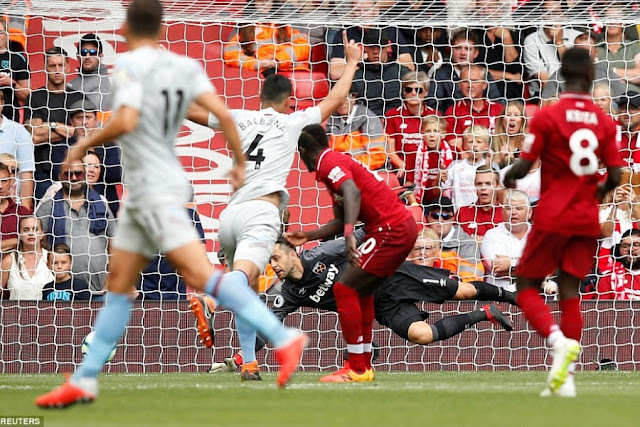 Salah opened the scoring in the 19th-minute opener from Andy Robertson’s cross on his return to action for the Reds at Anfield. Senegalese attacker, Mane netted twice from inside the box either side of half-time before substitute Daniel Sturridge bundled in a late fourth. Liverpool without hitting top gear, certainly look like the title challengers most consider them to be.